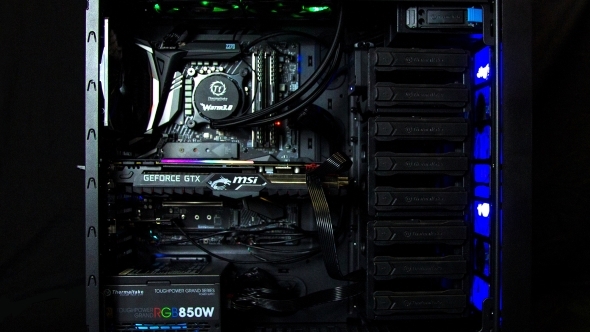 Building your own gaming PC is not just an immensely satisfying experience, it also means you can tailor your build to your own personal needs. And it’s also remarkably easy too. No longer do you have to mess about with jumper switches, northbridges, and clock timings, you just need a little guidance, a little patience, and the right components. As for the rest it’s like building a simple LEGO set. But why not just save yourself all the hassle and buy a pre-built gaming rig? There’s not a huge price-premium on a full build these days, and you can blame someone else. But we all use our PCs differently and that means we don’t all need the exact same setup. The problem with buying an off-the-peg gaming PC is that you will only have access to the components that a particular system builder can offer. PC builders often have supply deals with different manufacturers meaning you might not be able to get the exact combination of graphics card, motherboard, CPU, memory, and SSD that you want. Build it yourself and there’s no limits apart from your imagination. It will also foster a beautiful little bond between you and the new gaming PC you helped bring into the world. Awww. We’ve gone into more detail about the entire build process in the video above, so give that a look for the full step-by-step guide, but here’s the basic rundown of getting your PC parts together. Once the components are in place you’ll need to get an operating system, such as Windows, installed and optimise your new rig. But that’s for part two of our build guide. This is the preliminary step almost no-one takes when building their own gaming PC from scratch, but it can help save you a lot of heartache and scraped knuckles later on down the line. The second part of our guide looks into how to get the most from your components by optimising the drivers, OS, and software. As tempting as it might be to start building as soon as all the goodies arrive, when you’re buying all the components individually it’s worth checking the main ones are functioning. Especially before you take the time to lovingly install them in your new chassis, all cable-tied and tidied away. If something’s not right when everything’s in place it can be a lot tougher to find the offending component and get it replaced. So, before you go any further setting up the motherboard on the anti-static bag it comes in, using its cardboard box as a test bench, with the CPU, cooler (with thermal paste applied), memory, and graphics card all in place will allow you to check they’re all okay. Plumb in the PSU cabling, connect it to your monitor, and boot it up. You don’t need storage here as we’re just making sure you can boot into the motherboard BIOS to ensure the main parts are out-of-the-box perfect. If you can get into the BIOS without issue then you’re golden, and can shut down, taking everything apart, but leaving the CPU, cooler bracket, and RAM in place for installation later. Now we can start getting everything into that new chassis. We’re starting with the power supply and the water cooler’s radiator as they’re the bulkiest of parts and will need to be installed before anything else gets in the way. We’ve used a fully modular PSU, so we can install the main unit in the base of the PC without any hassle. 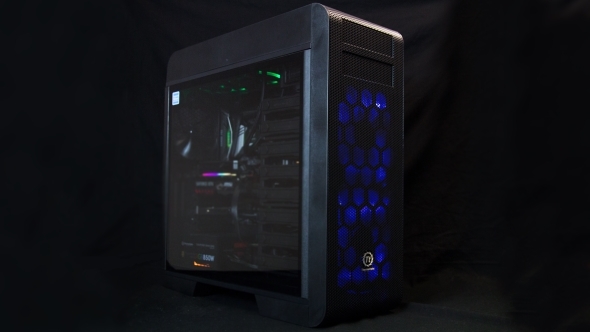 The radiator is fitted in the roof of our Thermaltake case, with the fans blowing air up from inside the case, over the radiator, and out of the top vent. Check the fans to see which direction they will push the air – often there will be telltale arrows on the sides of them, but generally the air will be shifting from the logo’d side. This is where your machine really starts to take shape, with the motherboard, processor, and memory in place. Having tested these bits earlier they can all be left in the board – dropping the CPU and RAM in before installation can save a bit of fiddling around and can make sure you don’t accidentally jam an errant thumb into the delicate CPU socket because you can’t quite see what you’re doing. 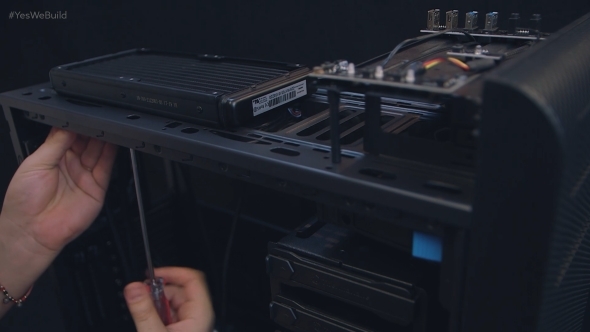 But first make sure the motherboard risers are in place in the mounting tray of your case. These are the little stands that the motherboard screws into. In general your case will likely have these already in place for an ATX design, but you might have to rearrange them if you’re installing a smaller motherboard. If you were to install the board directly into the metal of the case then you’re probably going to fry the silicon out of your poor little PC bits. It’s also worth checking here whether there is a cut-out behind the CPU socket in the chassis’ motherboard mounting tray. If there is you will be able to access the rear to adjust the CPU cooler bracket. If there isn’t you’ll absolutely have to make sure this is in place before you fit the motherboard. With the CPU cooler’s mounting bracket installed onto your motherboard you’ll need to get the actual cooler itself sat atop your processor. If you’re using the cooler straight out of the box (without the preliminary testing first? tsk.) then it’s likely to either have some pre-applied thermal paste or a transparent sticker saying ‘remove before installation’. Make sure to remove one and not the other. But if you did test earlier you’ll need to wipe the contact point of the cooler and the CPU clean before applying some more thermal paste. This ensures a good contact between the chip and the chiller for the necessary heat transference. 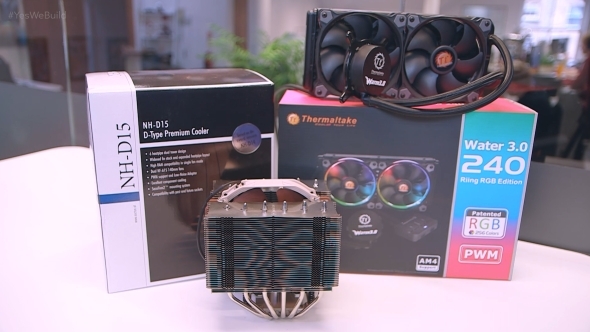 Should you choose to install an air cooler rather than the liquid cooler we’ve used then you’ll also have to think about fan orientation here. You want to vent the hot air outside of the chassis, so you’ll need to ensure the fans are blowing air across the heatsink and towards the exhaust fan of the case. We’re installing SSDs into our build here, because we’re super cool and living on the cutting edge of PC hardware. But if you’re creating a budget build, or are dropping an old hard drive from a previous PC in there for some data storage, the process is largely the same. Most chassis these days have tool-less drive bays, meaning you can install a 3.5-inch hard drive in seconds. With a 2.5-inch SSD chances are you’ll have to get your screwdriver out again and attach it to a drive bay caddy that way. 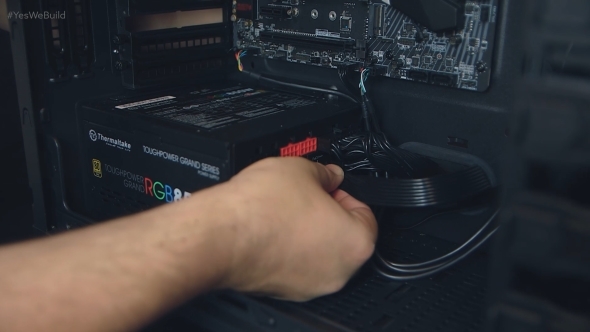 For both these SATA drives you’ll want to make sure the power and data connections are facing the back of the case. For a modern M.2 SSD you’ll need to locate the socket on your motherboard and simply screw it in there. Remember when I said building a PC was easy? Yeah, it mostly is, but there are some truly tedious parts… and this is one of them. Making sure everything is properly connected and wired in is absolutely vital as otherwise you get nothing but a blank screen and some chest pain. It also makes what was a lovely clean build up to now look messy. Fingers crossed your new chassis will have some cable routing options allowing you to feed wires behind the motherboard and out of sight of your PC’s tempered glass peep hole. As our PSU is entirely modular we first need to plug all the relevant power cables into it. So for us that’s the main motherboard, CPU, SATA, molex, and graphics card power cables. Everything bar the PCIe power connectors for your graphics card can be fed out through the chassis cable routing systems. Make all your games look awesome! Installing a new graphics card is really easy, but we’ve left it until the end because it’s really awkward to work around if it’s sat in the motherboard. 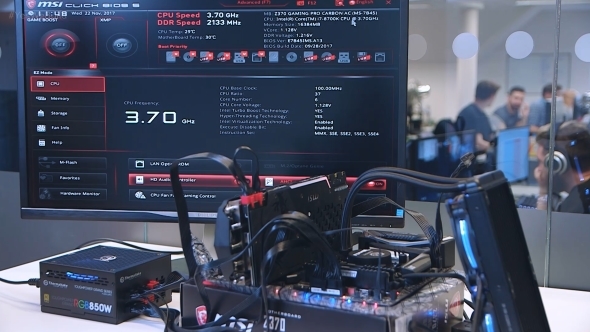 You just need to install it in the PCIe slot closest to the CPU – this is traditionally the primary PCIe socket – and then connect the relevant power cables direct from the PSU. 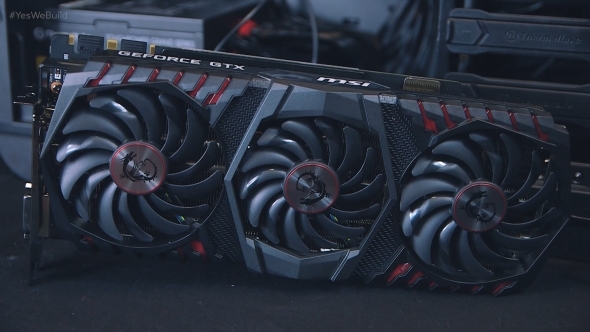 Most modern graphics cards need these extra power connections, but if you’re running a lower-end GPU, such as the RX 560 or GTX 1050 Ti, you will probably be able to deliver your card all the power it needs via the PCIe slot itself. But if there’s a socket on the card, then that needs to be filled. Once everything’s in place your PC is ready to roll. But don’t go through all the finicky cable tidying rigmarole yet, or attach the sides of your chassis either. It’s best to do your first boot with access to the inside of your newly built machine so you can instantly check that all the fans are working and that there aren’t any errant cables getting in the way. Do one last check over the cables going into your board, flick the switch on the back of the PSU, press the power button on your PC, and watch in amazement as it bursts into life (and not flames). Of course it might not necessarily be perfect straight off the bat – but if it doesn’t immediately boot don’t panic, there are a couple of quick checks you can do. RAM can be temperamental, so shutting the machine down and reseating your memory might help, as might loosening off the CPU cooler screws a touch too. Sometimes, if you overtighten the mounting bracket, you can bend the motherboard, which can affect the delicate connections on the PCB.